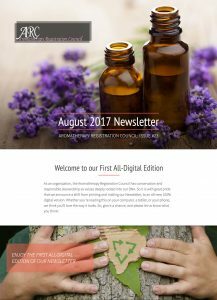 Please take a look at the August 2017 edition of the Aromatherapy Registration Council Newsletter. This is an all-digital, responsive, mobile friendly newsletter – no downloading or printing necessary! Please take a look at the September 2015 edition of the Aromatherapy Registration Council’s newsletter. You may also download the PDF directly by clicking here. Please take a look at the June 2014 edition of the Aromatherapy Registration Council’s newsletter. You may also download the PDF directly by clicking here. Please take a look at the December 2013 edition of the Aromatherapy Registration Council’s newsletter. Please take a look at the August 2012 edition of the Aromatherapy Registration Council’s newsletter.